15 Dollar Store ~ Everything $15 Plus Free Shipping Available! October 10, 2011 · by Zack & Katie · Post may contain affiliate links. See my disclosure policy here. 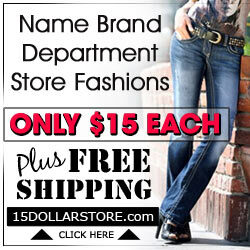 You can get name brand jeans, shoes, jackets, and just about everything for $15!! You qualify for free shipping when you buy at least 7 items! Check it out by clicking the above image!